Home > Breweries > Food & Drink > It’s “oil systems go” for East Yorkshire’s first smoked rapeseed oil! It’s “oil systems go” for East Yorkshire’s first smoked rapeseed oil! 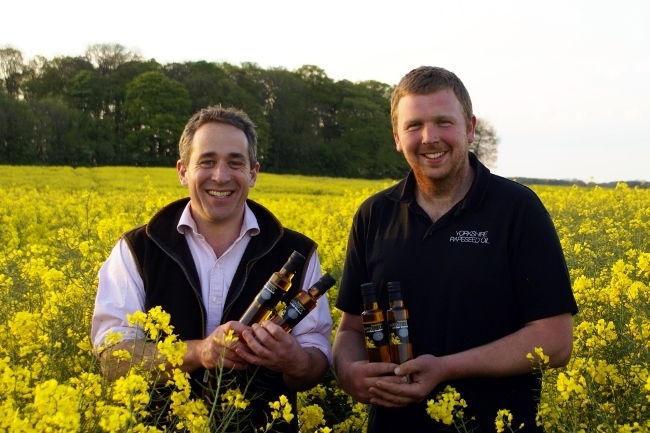 Two young artisan producers have combined their expertise to produce East Yorkshire’s first smoked rapeseed oil. Staal Smokehouse has been burning the midnight oil to collaborate with fellow family business Yorkshire Rapeseed Oil and has launched Oak Smoked Yorkshire Rapeseed Oil. The award-winning East Yorkshire smokery has joined forces with the Thixendale farm diversification business to create an Oak Smoked Rapeseed Oil that is hand crafted and smoked over oak and apple wood for a fuller flavour. Staal Smokehouse founder, Justin Staal and fellow family business owners Adam and Jennie Palmer from Yorkshire Rapeseed Oil, started talking about how they could combine their expertise after meeting at a tasting event at Hornsea Farm Shop, William’s Farm Kitchen, in 2012. “Smoked food is really popular at the moment – with homesmokers and barbecue restaurants popping up all over the place. “We wanted to tap into people’s love of smoky food by giving home cooks a delicious culinary oil to work with too and spent months looking for just the right oil to smoke. “We were naturally delighted to find award winning Yorkshire Rapeseed Oil within 30 miles of the Long Riston Smokehouse.